I was excited to receive an invitation from Marsden Primary in Nelson to design then deliver a series of writing sessions with some of the Year 4 and 5 pupils. The six sessions covered lots of different aspects of story writing including characterisation, setting, creating action sequences and tension and forming endings. Over the six weeks, the children pulled apart my writing before creating their own version. There was lots of ‘writerly talk’ and the children gained an insight into the thinking behind my writing. They also developed their comprehension skills and inference abilities due to plenty of questioning and probing of the various texts. Following each weekly session, the pupils spent time in their writing club using the plans and ideas to create first drafts. 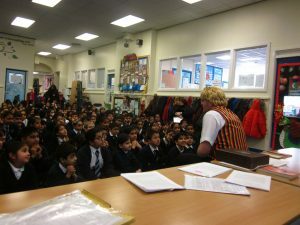 The six sessions were fantastic and allowed me to build on previous learning, adding to the children’s writer toolkits. I finished my time with the children by wishing them well for their future writing adventures. 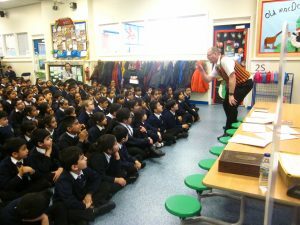 Whilst I was visiting Marsden, I shared my writing journey in asssembly with the KS2 pupils. I even put on the storytelling waistcoat to stare one of the Tales. The accompanying book signing allowed time for questions and chats – fabulous! Dan Worsley was commissioned to deliver a 6 week writing project in our school. The brief was very bespoke has it as very much planned with the needs of our learners in mind. All the children chosen have English as an additional language. The aim was to develop their vocabulary and editing skills so that their writing was up levelled and engaged the reader through the language used and ‘showing rather than telling’ approach. The target group was Year 4 and Year 5 more able writers who were also disadvantaged. Dan enthused and engaged them from the start, through sharing his own writing examples and teaching them his techniques. High level language was modelled and the children planned their writing with Dan, ‘magpieing’ ideas along the way. Staff accessed his sessions as part of their CPD to support them in developing their own teaching and modelling of writing skills and we are looking at getting Dan to deliver staff Inset later in the year. Each session layered the learning and in the days following each session the children transformed their planning into quality written pieces. All the children who accessed these session are not at age related expectations or greater depth for their writing. Dan is an excellent role model and his dynamic personality cannot fail to excite those he works with.